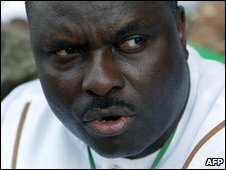 One of Nigeria's most influential and wealthy politicians, James Ibori, has been arrested in Dubai. The former governor of oil-rich Delta state is accused of stealing funds worth $290m (£196m) by Nigeria's EFCC anti-corruption agency. Last month, police were attacked by Mr Ibori's supporters while trying to arrest him in his home town. For years, he has denied corruption allegations but is also wanted by police in the UK. He is a senior figure in Nigeria's ruling People's Democratic Party (PDP) and played a key role in the 2007 presidential election victory of Umaru Yar'Adua, who died last week. Economic and Financial Crimes Commission (EFCC) head Farida Waziri told the BBC that Mr Ibori had been arrested on Wednesday following the intervention of the international police agency Interpol. He is currently in custody but it is not clear whether he will face extradition to Nigeria or the UK. "We are consulting on the next line of action, whether the Metropolitan Police will want him to stand trial there in London. We also have a case here pending against him," Mrs Waziri said, reports Reuters news agency. She also said that the EFCC wanted to press new charges against him, without giving any details. In 2007 a UK court froze assets allegedly belonging to him worth $35m (£21m). His annual salary was less than $25,000. He had already left the UK when his assets were seized. He was first arrested in Nigeria in December 2007. Two years later, a court in Asaba cleared him of 170 charges of corruption, saying there was no clear evidence to convict, sparking the anger of the EFCC. Under Nigeria's federal system, state governors enjoy wide powers. Those running oil-rich states have budgets larger than those of some African countries. They enjoy immunity from prosecution while in power, but several have faced corruption charges since leaving office after the last election in 2007.